Nationally and internationally acclaimed artist, Joe Fafard, was born to French-Canadian parents in the small agricultural community of Ste. Marthe, Saskatchewan. He attended the University of Manitoba (BFA 1966) and Pennsylvania State University (MFA 1968). He taught at the University of Saskatchewan, Regina College from 1968 to 1974 and was visiting lecturer at the University of California at Davis in 1980-1981. 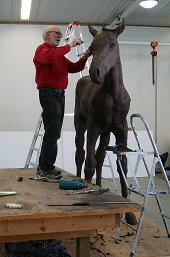 Joe Fafard is a distinguished full time artist and sculptor who currently resides on an acreage near Lumsden, Saskatchewan. Fafard is one of Canada’s leading professional visual artists and has exhibitions of a wide variety of work in galleries and museums across the country and around the world, including the United States, Great Britain, France and Japan. He is widely recognized as being at the forefront of his art, and his outstanding contributions to the arts have significantly raised the profile of both Saskatchewan and Canada on the national stage. He was named an Officer of the Order of Canada in 1981; awarded the Architectural Institute of Canada Allied Arts Award in 1987; received an Honorary Degree from the University of Regina in 1989, and from the University of Manitoba in 2007; received the Saskatchewan Order of Merit in 2002; received the National Prix Montfort in 2003; received the Lieutenant Governor’s Saskatchewan Centennial Medal for the Arts in 2005; was named CTV Citizen of the Year in 2006; and most recently received the Saskatchewan Arts Board Lifetime Achievement Award in 2007. In the early 1970’s, much of his sculpture used clay as a medium. In 1985, he shifted to bronze as his chief sculptural medium, successfully establishing a foundry in Pense. His insight and humour characterize his portraits of neighbors, farm animals, and famous artists that he came to respect as he learned his craft. His work in bronze is displayed across Canada and his ‘cows’ have become one of his trademarks.